Huge savings now on photo mags, for the gift that always delivers! A subscription to a photography magazine is the perfect gift for any enthusiast image-maker. And with a huge range of titles on offer, there's something for everyone, regardless of skill level and camera system. At the moment, there are huge savings to be had in the MyFavouriteMagazines store. Best of all, many of these savings apply worldwide, so everyone can get a great deal: from print and digital magazine subscriptions to bundles, binders and back issues. Digital editions of the magazines are particularly cost effective for those living outside the UK. With most titles publishing 13 issues per year, a magazine subscription really is the gift that keeps on giving – whether for yourself, partner, friend of family member. 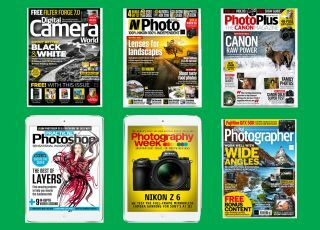 The titles below are sister brands to Digital Camera World, meaning they're staffed by experts in their field, and deliver a great mix of tutorials, tips, buying advice, reviews and inspiration in every issue.